Our Document Management software stores all the marketing paperwork that your sales team uses to send to customers, including brochures, specifications, images and more. 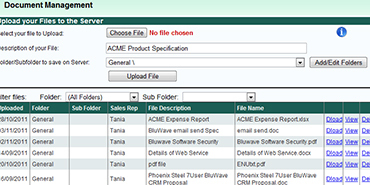 Once these documents are uploaded into the BluWave CRM server, your sales team can use them in several ways: they can email them to customers from within the CRM software, or they can attach them to quotations prepared in the automated quotation module. An extra benefit is that if salespeople prepare customer proposals or quotations outside of the BluWave CRM system, they can store these in a private “Quotes” folder within the system and can continue using them with other parts of the software. Our Document Management helps make the sales process more streamlined and organised, ultimately increasing the productivity of your salespeople. Need to know more about this feature? Contact us today.